Scott Kazmir, who had an opt-out clause in his contract, will remain a Dodger. Pitcher Scott Kazmir will not exercise a clause in his contract that would have allowed him to walk away from the final two years and $32 million in his contract with the Dodgers. 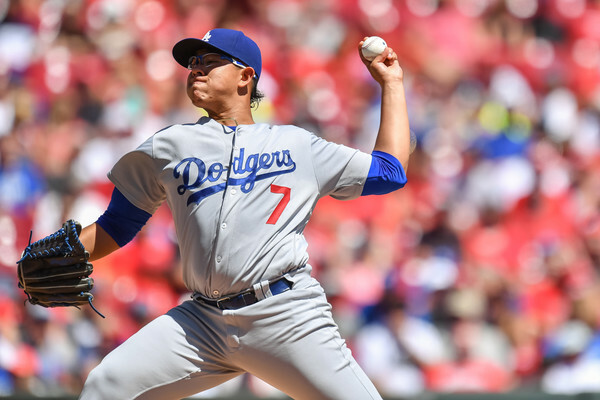 Dodgers’ rotation for final six games leaves as many questions as answers. Update. Update (6:20 p.m.): Roberts said that Kershaw, Hill and Maeda will start Games 1, 2 and 3 of the National League Division Series against the Washington Nationals in that order. The starting assignment for Game 4 is to be determined. Maeda wanted two starts before the regular season ends, not one, which is why he’s starting tonight and not tomorrow. Game 154: Dodgers are one win away from clinching the National League West. The Dodgers beat the Colorado Rockies in familiar fashion, 5-2, and can clinch the National League West title as early as tomorrowThe box score is here. 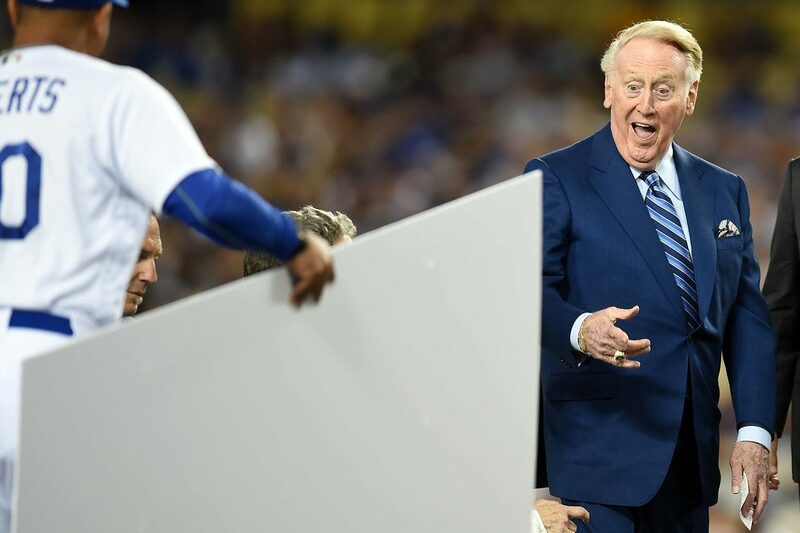 The photo gallery from the Vin Scully Appreciation Day ceremonies is here. In case you missed it, here’s what happened. The Dodgers’ active roster swelled to 39, shifting the focus of the final week to potential playoff roster cuts. Scott Kazmir, Chris Taylor and Brandon McCarthy are about to give the Dodgers a full active roster. Scott Kazmir was activated from the 15-day disabled list, and Chris Taylor was recalled from Triple-A Oklahoma City, giving the Dodgers 39 players on their active roster for tonight’s game against the Colorado Rockies. The 40th man, pitcher Brandon McCarthy, is on the 15-day disabled list. 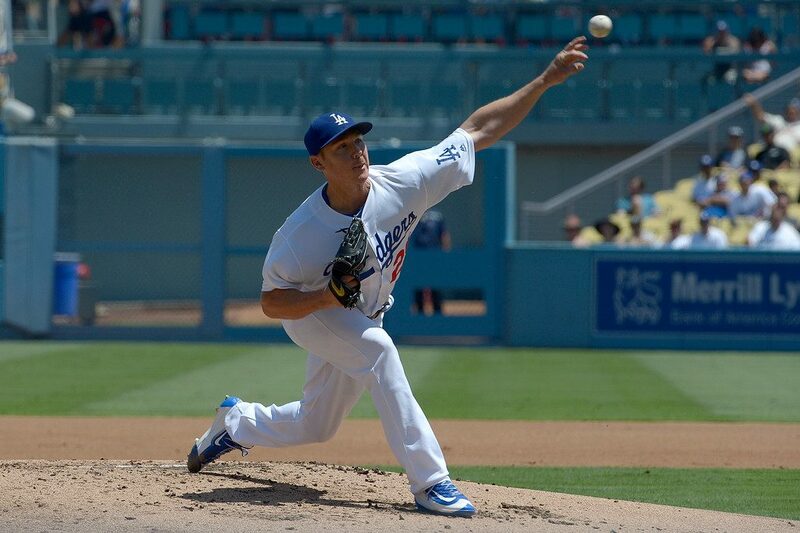 He threw a 75-pitch simulated game at Dodger Stadium on Tuesday. This afternoon, McCarthy threw a bullpen session and manager Dave Roberts said he will be activated from the DL before the regular season ends a week from Sunday. That means the Dodgers will have a full complement of 40 players on the active roster. That’s a rarity in September, and perhaps the Dodgers will be unique in that regard in MLB. In any event, it will be a logistical nightmare if all 40 players are asked to fit inside the visiting clubhouses in San Diego and San Francisco, where the Dodgers end the season next week. Game 152: Yasiel Puig and the Dodgers push the Giants further to the brink. 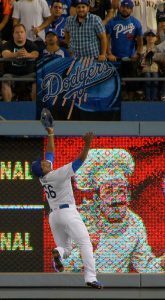 Yasiel Puig and the Dodgers exorcised their demons against left-hander Matt Moore in a 9-3 win over the San Francisco Giants. The box score is here. Veteran left-handers Brett Anderson and Scott Kazmir will have a chance to audition for a playoff start down the stretch. Looking ahead to the postseason is only natural, writes columnist Jeff Miller, while the Dodgers take it one game at a time.